Britain’s Jamie Murray has rejected claims of men being treated more leniently than women by umpires. The American claimed it was “sexist” and her view was endorsed by former champion Billie-Jean King, who said there was a “double standard”. Murray said it was “a bit far-fetched” to say men are treated differently. Williams was seeking to equal Margaret Court’s record of 24 Grand Slam singles titles and was facing 20-year-old Osaka at Flushing Meadows in her first major final. The 36-year-old had already had a point penalty for smashing her racquet and a code violation for coaching when she was penalised further for calling Ramos a “thief” and a “liar” in New York. Speaking on the eve of Great Britain’s Davis Cup match with Uzbekistan in Glasgow, US Open mixed doubles champion Murray told BBC Sport: “I think the umpire did what was within his rights. “Coaching is common, a lot of people are doing it, some people aren’t getting called for it. To get called in a Grand Slam final was perhaps a bit tight, but I think the reaction was pretty overboard. American player Steve Johnson added: “Look, I don’t want this to come out the wrong way, but he enforced rules that have been enforced on me over the years. 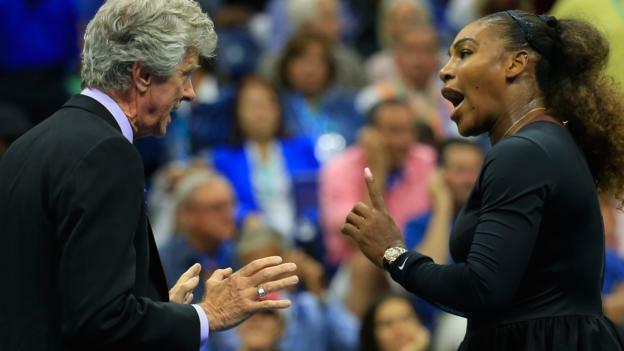 Women’s governing body the WTA supported Williams and chief executive Steve Simon said the umpire showed her a different level of tolerance over her outbursts than if she had been a man. The International Tennis Federation, meanwhile, defended 47-year-old Ramos and said he acted “at all times with professionalism and integrity”.